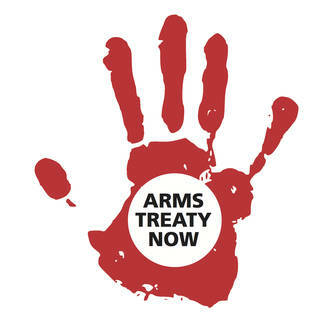 Join the campaign for a strong and effective international Arms Trade Treaty. Find out what is needed to make the Arms Trade Treaty effective. Churches see the suffering and chaos fuelled by the irresponsible trade in arms and say: enough! Every day, somewhere in the world, 2000 people die as a result of armed violence. There are currently more global regulations for the sale of a banana than for the sale of weapons. As people of faith, we hear, witness and/or experience the effects of this uncontrolled trade or irresponsible transfer of weapons, and we are keenly aware of their catastrophic effect when they get to the wrong hands. Update: On 2 April 2013, an overwhelming majority of 155 countries voted in favour of an Arms Trade Treaty at the United Nations General Assembly. The Ecumenical Campaign for a Strong and Effective Arms Trade Treaty is now advocating for swift ratification. The treaty will enter into force when it has been ratified by 50 states. The treaty includes important provisions to protect people that were sought by the World Council of Churches and campaign members in 40 countries. As it is implemented, the new treaty can start to help save lives and protect communities. Personal testimonies demonstrate the human consequences of the arms trade and the direct impact that conventional weapons have on the lives of people around the world. We believe that a strong Arms Trade Treaty based on human rights and International Humanitarian Law will save lives and reduce human suffering. The Human Scope: what's your story?